Home » Climate Change » Will Climate Change Affect Water Supply on the Missouri River? Will Climate Change Affect Water Supply on the Missouri River? How climate change will affect water supply from the Missouri River is not yet known. Current problems with Missouri River water supply principally affect the barge transportation industry, and the agricultural and industrial clients that use it to transport their goods and supplies. The Missouri River is important for Missouri. More than half of Missouri residents get their drinking water from the Missouri River or the alluvial aquifer it directly feeds. Not only that, the river’s water is used for agricultural irrigation, for industry, to support barge traffic along the Missouri and Mississippi Rivers, for recreation, and to support the ecosystems that depend on the river for their survival. Figure 1. Dams and Other Locations Along the Missouri River. Source: Google Earth. In the previous post, I reported that the snowpack in the western United States has declined by 23%, and it is forecast to decline more by 2038. The eastern border of the study area forms the western boundary of the Missouri River Basin. Will the changing western snowpack impact the Missouri River’s ability to supply Missouri’s needs? The answer is complicated. 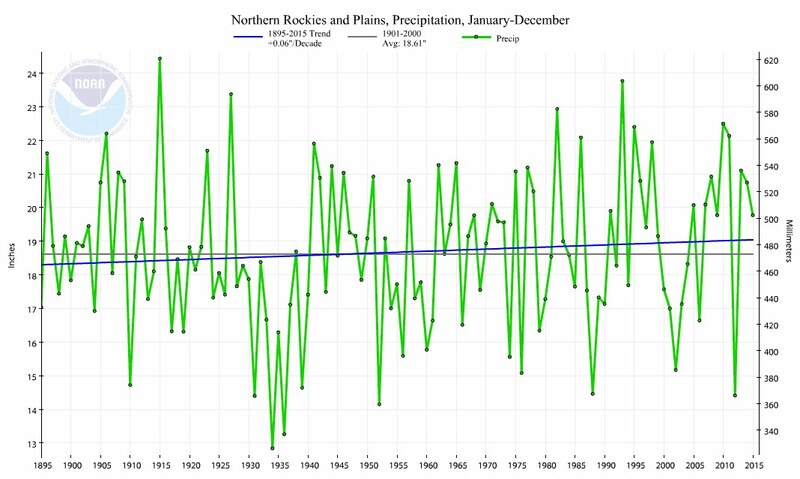 Precipitation in the Upper Missouri River Basin has historically fallen mostly as snow, building a winter snowpack that slowly melts during the spring. The snowmelt is gathered into reservoirs created by 6 large dams along the Missouri River, plus more than 40 smaller ones on tributaries. The 6 large dams begin at the Gavin’s Point Dam on the Nebraska-South Dakota border, and extend upriver to the Ft. Peck Dam in Montana. (See Figure 1.) The result is that water flow below the reservoirs is largely controlled by man, not nature. Figure 2. Data source: Wikipedia. The annual water yield from the Missouri River is small compared to the size of its basin. 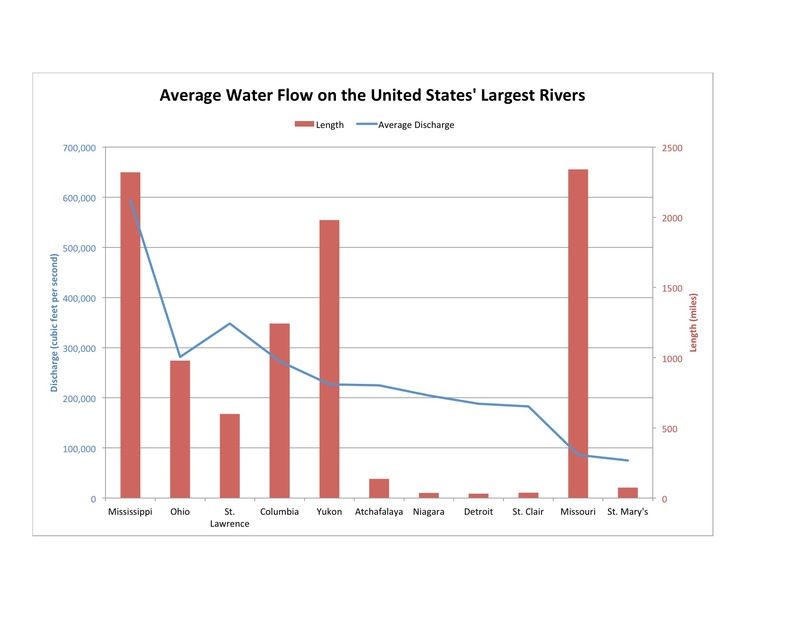 The data is given in Figure 2, where the red columns represent the length of the rivers, and the blue line represents their average discharge. No other river in the USA serves such a large basin with so little water. In drought years it is already too small to fully meet all of the demands that are put on it, resulting in conflict over how to manage the river, and over which values to give priority. The conflict has primarily been between up-river interests, which would like to see water allocated to support irrigation, drinking water, and mitigation in their states during periods of drought, and down-river interests, which would like to see water released to support commercial navigation on the river. Figure 3. Source: Hansen Professional Services, Inc. 2011. In 2004, the Army Corps of Engineers changed the rules by which the river is operated to reduce water releases during drought. During drought years, this better supports up-stream interests, but results in a shorter season during which the river can support barge traffic. 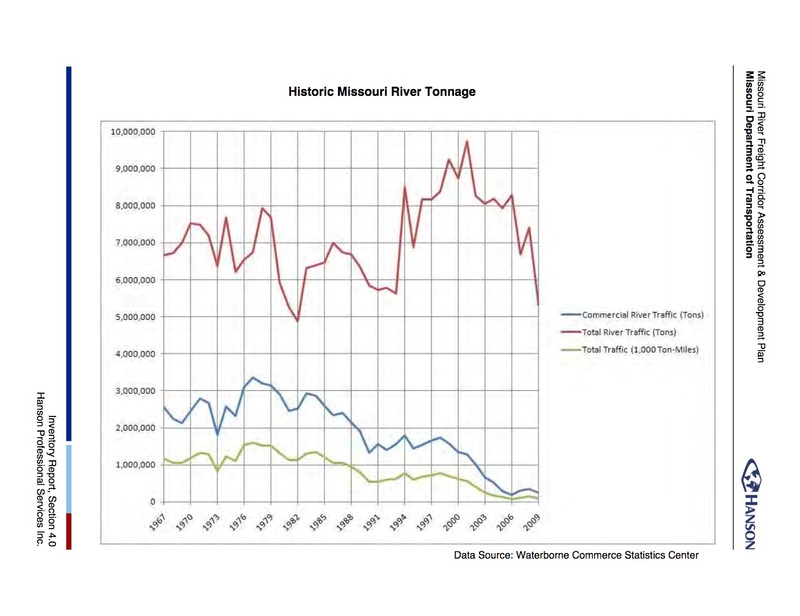 The result has been a decrease in annual tonnage moved on the river (Figure 3). Figure 4. Well Drilling in Western North Dakota. Source: Vanosdall 2013. In addition, development in the Upper Missouri Basin has increased water demand in that region. 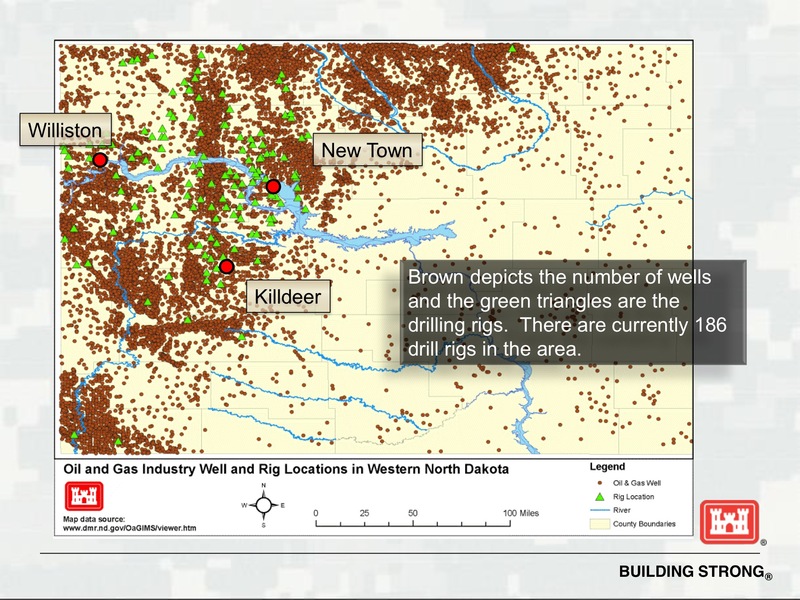 A prime example would be the development of the oil and gas reserves in North Dakota. Well drilling uses large quantities of water. (See Figure 4). Given that the water yield from the Missouri River is already too small to fully support all of the demands placed on it, any increase in demand is bound to constrain supply even further. The constraints discussed above, however, are all man-made constraints. How will climate change and the declining western snowpack affect all of this? Source: National Centers for Environmental Information. The snowpack decline has occurred because of increasing temperature, not decreasing precipitation. Figures 5 repeats a chart I published in January 2016, showing that precipitation has increased in the region over time. Figure 6. Source: Melillo 2014. 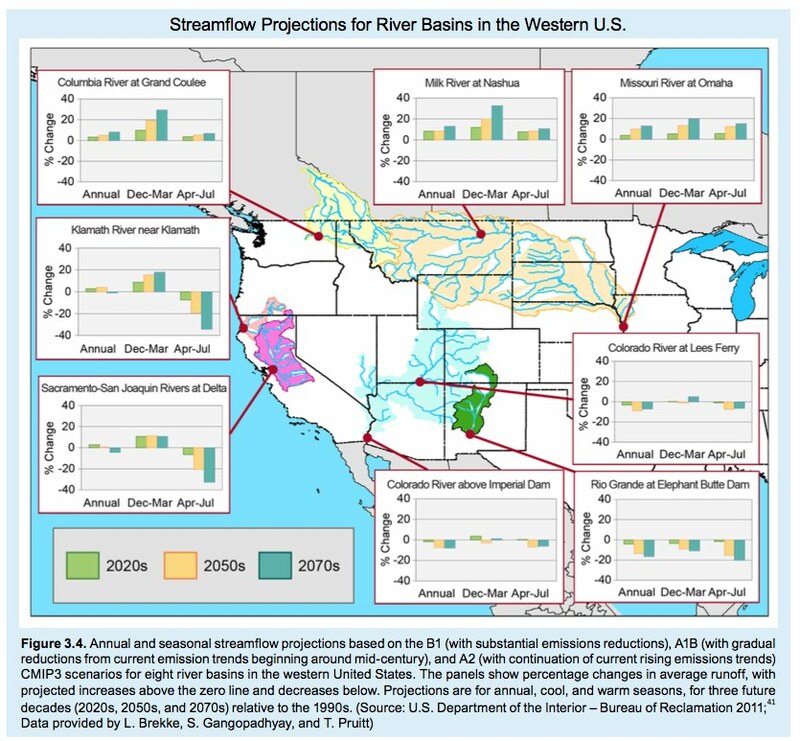 Figure 6 shows that the 2011 National Climate Assessment projects that the annual flow on the Missouri River will actually increase by about 15% by 2070. However, more precipitation will fall as rain instead of snow, and the snow that does fall will melt sooner. This means that more water will enter the reservoirs during winter and early spring, and less during late spring and summer. In addition, increased temperature will increase evaporation from the river and reservoirs, and it will increase water consumption by crops, leading to earlier and increased demand for water. There is a potential mismatch between when the water is available and when it is needed. The question will be whether it will be possible to manage the reservoirs successfully under the new conditions. When looking at the water situation in California (here), we discovered that water authorities expected climate change to create reservoir management problems that would result in an increased water deficit during the summer and autumn. It is possible that the reservoirs along the Missouri will encounter similar problems, but it is not certain. One potential difference is that California has multiple, relatively short rivers, leading to only one large reservoir per river, and perhaps one or two small feeder reservoirs. The Missouri River, however, is a single long river. It has 6 large reservoirs chained along it, plus at least 40 feeder reservoirs on tributaries. This may give managers flexibility in managing the river that is not possible in California. Five separate water resource studies have been undertaken to determine how climate change will impact the ability of the Missouri River to meet the demands placed on it. Unfortunately, they have not all been completed, and I can find no comprehensive analysis. For the time being, problems with water supply on the Missouri River involve human decisions about how to manage the river. To date, in the State of Missouri they have primarily impacted the barge industry, plus the farmers and industries that depend on the barge industry to transport their goods and supplies. Drew, John, and Karen Rouse. 2006. “Missouri Water in High Demand.” Missouri Resources, Winter, 2006. Downloaded 5/31/2017 from https://dnr.mo.gov/geology/wrc/docs/Water-InHighDemand.pdf?/env/wrc/docs/Water-InHighDemand.pdf. Bureau of Reclamation. 2016. Basin Report: Missouri River. Downloaded 5/25/2017 from https://www.usbr.gov/climate/secure/docs/2016secure/factsheet/MissouriRiverBasinFactSheet.pdf. Bureau of Reclamation. 2016. SECURE Water Act Section 9503(c) – Reclamation Climate Change and Water. Prepared for United States Congress. Denver, CO: Bureau of Reclamation, Policy and Administration. Downloaded 5/25/2017 from https://www.usbr.gov/climate/secure. Hanson Professional Services, Inc. 2011. 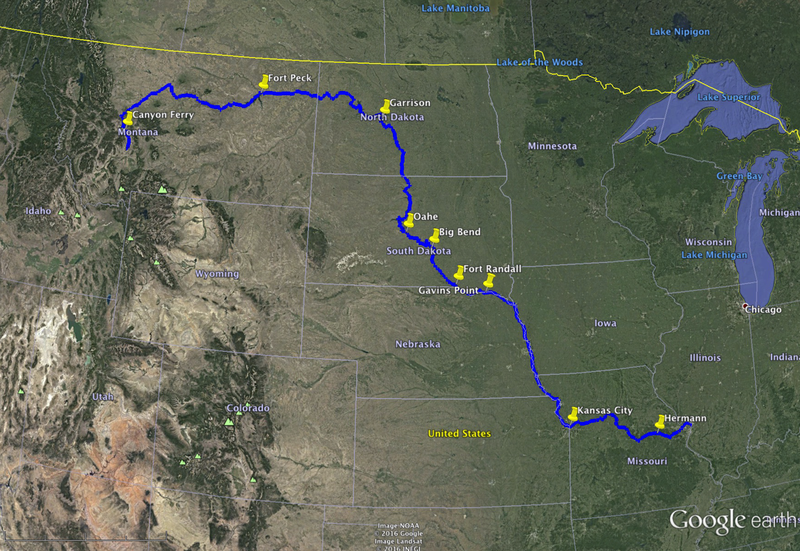 Missouri River Historic Timeline and Navigation Service Cycle. Missouri River Freight Corridor Assessment and Development Plan. Downloaded 5/31/2017 from https://library.modot.mo.gov/rdt/reports/tryy1018. Melillo, Jerry M., Terese (T.C.) Richmond, and Gary W. Yohe, Eds., 2014: Climate Change Impacts in the United States: The Third National Climate Assessment. U.S. Global Change Research Program, 841 pp. doi:10.7930/J0Z31WJ2. Available online at http://nca2014.globalchange.gov. Vanosdall, Tiffany. 2013. Missouri River Water Supply. US Army Corps of Engineers. Downloaded 6/1/2017 from https://denr.sd.gov/coewatersupply22Apr2013.pdf. Wikipedia. List of U.S. Rivers by Discharge. Data retrieved online 5/31/2017 at https://en.wikipedia.org/wiki/List_of_U.S._rivers_by_discharge. By mogreenstats in Climate Change, Consumption and Supply, Other Climate Change, Other Water, Water on 2017/06/22 .